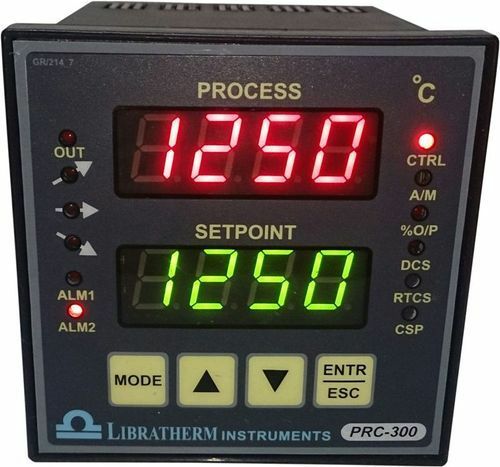 Libratherm offers Microcontroller based multiple Ramp / Soak programmable PID temperature controller Models PRC-300, PRC-967 and PRC-309, which are designed to improve reliability, accuracy and control for all processing applications. It features Ramp and Soak functions (the capability to control the temperature and its rate of change over a predetermined time span). PRC-300 and PRC-967 offer single profile of 16 steps and PRC-309 offer one to ten different patterns each of 16 (ramp/soak) steps, which can be programmed into the memory with the user-friendly membrane keyboard. Separate displays are provided to monitor simultaneously; the Process temperature, Set temperature and the Program number. They can also be used as single set point control when the profile control is not desired. They accept users selectable standard temperatures sensors like K, R, S and B-type thermocouples, or RTD(Pt-100) or 4-20mA/0-10VDC from infrared pyrometers or 0 to 1200mV from oxygen probe. The controllers offers both switching outputs in the form of SSR driver or Triac to drive external single or three phase Solid state relays or load contactors and linear analog control outputs in the form of (4-20)mA or (0-5)volt or (0-10)VDC, which can be used to control heater power through Thyristor power regulators (for electrical heating system) or to control the position of a modulating motor valve (for oil or gas fired heating systems). The analogue outputs can be directly connected to Libratherm make single phase / three phase SCR based phase angle fired power controllers, which are ideally suitable for both resistive and inductive heating load. Additional 4 relays are also provided for time or temperature dependent event outputs as per the system requirement. The programme profile and other parameters are retained in the nonvolatile flash memory in the event of power failure. To monitor the online temperature profile of the heating system, serial communication port on either RS232 or RS 485 interface can also be optionally provided, the same can be connected to the computer. Libratherm provides standard window-based software to view the online behaviour of the heating system in both graphical and tabular format. The controllers can also be operated and programmed through PC. Both switching and linear PID control outputs. Servo starts from the process temperature. User programmable 1-10 different patterns of ramp/soak steps. Retention and auto-execution of the program in case of power failure. Facility to use as PID and ON / OFF controller.